Able Moving & Storage owns and operates 4 large warehouses located at 8050 Wellingford Drive in Manassas, Virginia. The warehouses were built specifically for storing office furniture, household goods, and equipment for residents of Ashburn VA. Goods are stored in wooden storage vaults or on steel racking. Proper padding and shrink wrapping are applied to all of your goods as appropriate, depending on whether the goods are placed in vaults or on racks. All four warehouses are inspected regularly by the Department of Defense as well as the Department of State, and must meet their stringent requirements. Able Moving’s secure facilities are fully protected by secure fencing, monitored by 24-hour video surveillance. Our secure, state-of-the-art warehouses feature the very latest in fire and theft protection as well as trained, full-time staff. Commercial Storage for Ashburn VA doens’t get much better. Able Office Moving has developed the ability to meet a higher level of service standards in one of the most needed areas in the country for service level improvements, Washington, DC metro areas, and the Mid-Atlantic region. 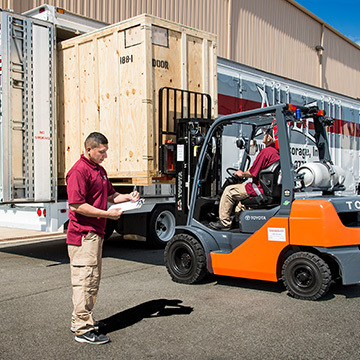 By using Able Office Moving, clients experience a new level of service quality for logistics distribution, deployment, and warehousing systems, all designed to support time sensitive transportation services throughout the mid-Atlantic region. Able Office Moving acts as a client advocate to offer assistance with any transportation and logistical need, supplement staff during special projects, and protect the client’s interest. Project management services include: planning, help desk resources, supervising, and managing services. A communications plan may also be provided. Planning a winning strategy and an accurate relocation budget may be a daunting task. Able Office Moving breaks this down into the manageable tasks outlined below, and assists with each step in the process. We provide only the best in Ashburn VA and surrounding areas. They did such a good job that we felt it was extremely important to go out of our way to let them know we felt this way. Chris steered us to a one day move over the weekend, which was not only cheaper for us, but allowed us to be more efficient as well. We literally had employees that were unplugged late in the afternoon on Friday arrive to the new space ready to go on Monday. Everything went perfect. I have been through five moves with the company and this is the first time that nothing was lost. Every employee crate that was packed was delivered to the new employee at their new space. The checklists they used were amazing. Communication with our Salesperson Chris Cox was outstanding. Checkpoint meetings before our move were especially helpful. He gave us a spreadsheet that had aspects of our move on it that had not even occurred to us. That’s what a good partner does. Simply put, Able was amazing. They just got it done. We could not have asked for an easier move. They were very, very, very nice and respected me. When it comes to commercial storage services, your business’s needs come first. Your specially assigned commercial storage specialist will work with you to create a customized storage plan, and then oversees all the details, so that you don’t have to. Able Office Moving will work with you to perform site surveys, and capture a detailed inventory of all assets, with the locations, schedule and functions for the destinations. This will be followed by a detailed scope of work, including an estimation of material and equipment required to pack and prepare the items for transit and to complete the relocation in an effective and efficient manner. Able will complete space plans, inspection of logistical constraints at the origin and destination, and routing details to apply solutions allowing all services to be expedited. These details determine the required support and functions to complete the project. New furniture, equipment and FF&E can be incorporated into Able’s responsibilities, so effective and necessary details can be managed accordingly. Able’s project management services are designed to assist you with details that meet the agreed upon goals specific to each project. The Able project management process will assist employees by providing packing demonstrations, implementing a color-coded move plan, designing floor plans, coordinating efforts with building management, and supporting your staff. Able Office Moving can arrange service for furniture and equipment requiring disassembly and assembly meeting or exceeded manufacturer’s standards and warranties. Packing services, specifics on containers/crates, the project schedule, supported by the labeling system tied to the floor plan is incorporated in Able’s scope of service. Able Office Moving can provide solutions from space planning to procurement; interior design; furniture assessment, refurbishing, installation and reconfiguration; and surplus management. Able works with the clients to identify not only the need, but also the solution. Able Office Moving has developed a nationwide network of multiple new product lines and pre-owned and remanufactured furniture brokers; this enables our team to provide quality furniture solutions at affordable prices to our clients. Additionally, the national exposure provided by this network provides the highest possible return to clients who need to liquidate excess furniture. Many members of Able’s team have backgrounds in the furniture and/or space planning industries. The client’s specific functional and operational needs, as well as budgetary requirements, are analyzed. Then appropriate, customized options are provided. Able can perform a complete inventory of the client’s existing furniture. After discerning the operational requirements (or working from a previously prepared space plan, if one is available), Able will generate a furniture layout utilizing as much of your existing furniture and its components as possible. Able will then provide a precise cost of parts and pieces needed to complete the furniture reconfiguration (if necessary) as well as cost estimates for these parts and pieces from our national furniture network. Able will then work with our national furniture network to provide you with an estimated return on the liquidation of any unwanted furniture or remaining parts and pieces. Able Moving & Storage, Inc. has identified an opportunity for businesses to reuse gently used furniture and other items instead of throwing them away, thus decreasing our impact on landfills. This minimizes the expense and potential risks for our clients.